Blazing heat and physical tasks proved to be a difficult combination for teams on Sunday's episode of "The Amazing Race." The first challenge teams encountered was a roadblock, which required them to weigh wood "Bangladeshi style," meaning on a scale using giant rocks to counterbalance the weight. But before they could weigh the wood, they had to build the scale itself. Team "Long Hair, Don't Care" was finished with the task before any of the other teams had even arrived. Other teams struggled with the task, which was made even more difficult by the heat and humidity. Ryan of Team Divorcees said he wants to beat the record for most No. 1 finishes currently held by Team Army, but then had to watch in defeat as Abbie struggled to complete the roadblock while the Twinnies finished and moved on ahead of them. Josh and Brent of the Beekman Boys arrived last, having been delayed by looking for the correct taxi stand at the beginning of the leg. Brent struggled to correctly construct the scale, and began to crumble under the stress and heat. He was able to eventually finish, but they lost a lot of time. The next challenge was a detour. Teams had to choose between "Straw Dogs" (whipping unprocessed jute on a bed of nails, twisting it into 20 coils and bringing the coils to machines that make jute bags) and "Bamboo Jungle" (collecting 40 bamboo poles in varying lengths and transporting them via rickshaw to a nearby construction site). Abbie and Ryan are the only ones who chose the jute. Everyone else tackles the bamboo, mistakenly believing it to be the easier task. Boy, were they wrong -- the bamboo poles were heavy, and the longest ones were almost impossible to manage. Chippendales James and Jaymes were excited at the start of the challenge ("We've been waiting to lift heavy things," Jaymes said), but they accidentally left three of their bamboo poles behind and had to go back and fix their error in the now-crippling heat. James and Abba finished in first place again, this time winning a trip to Malaysia. Abbie and Ryan were disappointed with their second-place finish, meaning that they had missed their chance to beat that "Amazing Race" record. The Beekman Boys were never able to recover that lost time, and were the last team to arrive at the pit stop. But, lucky for them, host Phil Keoghan said it was a non-elimination leg (not a surprise, since there has not been one yet this season) and that they'd go on to race another day, though a speed bump is now waiting for them. Next week, the teams head to Istanbul. 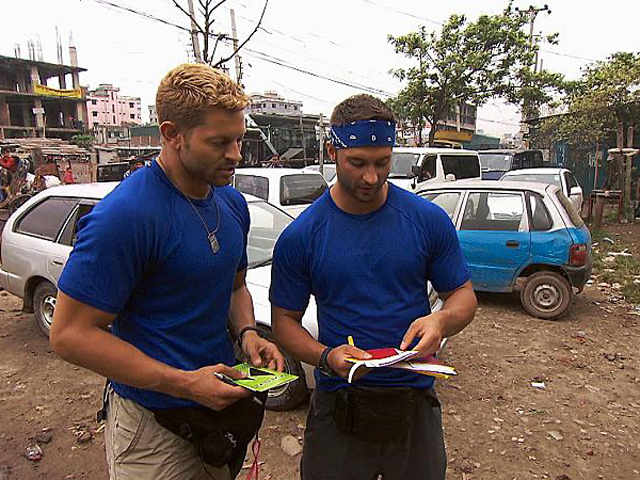 Which team do you think will win "The Amazing Race"? Vote in our poll and share your thoughts in the comments.